Ever walk by an organic chemistry teaching lab and wonder why people were standing behind blowtorches looking frustrated? First week of my senior year, I actually walked into that classroom. In this class we learned a lot about organic and inorganic synthesis, lab techniques, and how to really think like chemists. It was much less structured than previous classes so a lot of times things wouldn’t go as expected and we had to troubleshoot the problems. These are all skills I expected to learn sometime in my Georgia Tech chemistry education, but there was one skill I never anticipated needing to master before graduation: glassblowing. I don’t know why it never occurred to me that scientific glassblowing was a profession or even a position that universities frequently kept on staff but it didn’t. And that first day of class they announced a semester-long project where we would have to create 3 glass pieces for a grade. At first we all shrugged, watched the demonstration, decided it didn’t look too difficult and gave it our first try. I’ve always considered myself a fairly artistic person so I figured it would be an easy grade buffer for what was shaping up to be a very difficult class. Boy was I wrong. The glass melted and curled in ways we didn’t expect, getting the right gas/oxygen ratio to have the right flame shape and heat was impossible, people burned themselves left and right and nothing we made came out to look anything like the simple demonstration she gave us. Frustrated and burned, the 10 of us muddled through the 4 hour demonstration and practice session with the professional glassblower and when she finally left we looked at our TAs in horror and asked, “will we need to be able to do this well if we ever want to be chemists?”. Their response? Laughter. What did we expect. They probably go through this every year with the new crop of students. They told us that we wouldn’t need to be able to do this perfectly or really make custom glassware on a regular basis in order to be chemists. 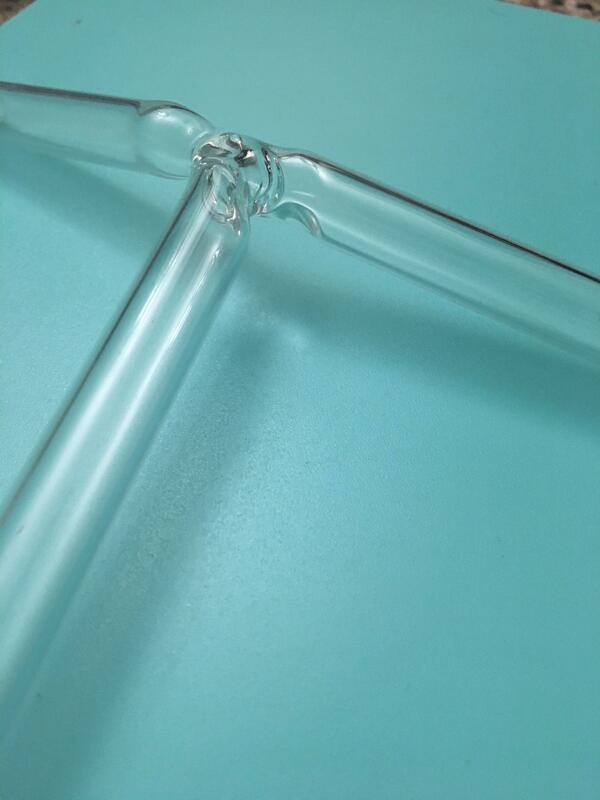 However, custom glassware was occasionally needed for experiments and one big point of the assignment was that we would then have an appreciation for what is and is not possible in glassblowing and just how difficult whatever we design would be to make. They also told us that even though as chemists we probably would never have to blow something as complicated as a Shlenck line ourselves, there is a very good chance we may need to have two pieces of glassware fused or a crack repaired and being able to quickly repair it yourself instead of waiting for a glassblower to get to your piece in a long line of work can be important to the success of a project up against a deadline. So we worked on creating our three pieces: an ampule, a T-joint, and a straight seal. They didn’t have to be pretty but the ampule needed to be air-tight and all of the pieces had to be worked out to the point where you couldn’t tell they were once separate pieces of glass. At the end of the semester, they loaded our ampules with [Co(NH3)5(ONO)]Cl2, a compound that changes color with prolonged air exposure, and had us seal them. Then we turned in our straight seals and T-joints. Long story short? Glassblowing is much harder than I ever thought it would be. I will probably never have to do it on a regular basis, but this was an incredibly fun, if somewhat stressful, skill to have the opportunity to develop. And if I ever need to seal something airtight I’ll know how!